I received that closing from a 15-year old great young man after speaking at his summer Bible camp. He thanked me in the note but his close spoke right to my heart. He is now slightly braver. I am too. You may have noticed on here that I am not a finished project. Not much about my life is all wrapped up with a pretty bow on it. Nor will I present that false image of myself to you. I am continuing to wrestle my faith. 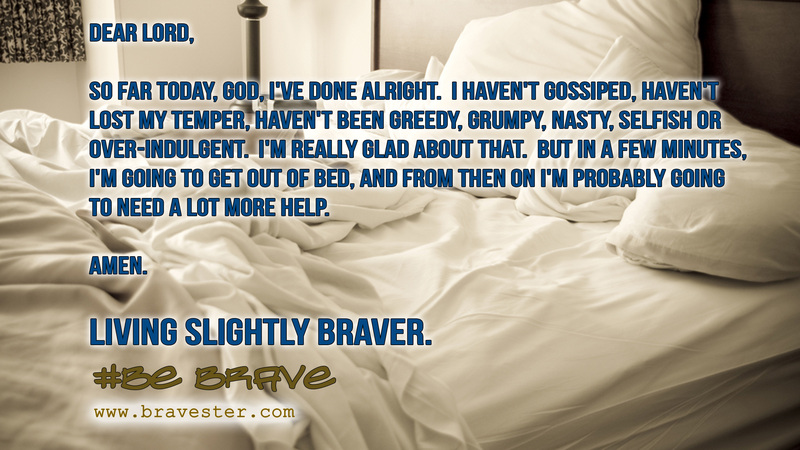 I am every day slightly braver (at least most days…I do have some days…) I wonder if you readers tire of hearing of pain and struggle and just want to get to the God-glorifying praiseworthy ending? There is this image that I constantly wrestle with. One I feel thrust upon me whether I want it or not. It is this image of having to be squeaky-clean, confident in God and self, knows the Word of God inside out, enthusiastic, has inner peace, fun-loving, bubbling over with joy, and full of wisdom. It really has little to do with me being a minister. It has all to do with me being a Christian. Someone somewhere along the way in history this sort of image has been thrust upon us. This is what a “successful” Christian is supposed to look like. I’m not quite sure how or when this standard was established but it is there. I know you know that too. You’ve have it thrust upon you too. You try to live up to it but know that you don’t. You try to prop up that image for others to see so they don’t see what is really going on with you. We’ve learned that we need to present this image at all times, particularly to the nonbelieving crowds so they desire what I’m displaying. But what if they knew of the times I’m angry with God? What if they knew that I don’t understand the simple Gospel of Luke? There was a time I re-read Luke three times in less than six months and did not understand it. What if they knew that my faith in God’s faithfulness is only as much as I start to feel pain? What if they saw this cross I have to carry? Sure, I do talk about my struggles. The struggles I’ve had. I present to them a finished product having dealt with sins and struggles in my past or at least those which have been freshly conquered. Again a shining example of the work of God in my life. A good reason for them to allow God into their lives. But when have I ever had a day that I’ve conquered all my sins and struggles? When have I been a finished project? Do you notice how a line has been drawn? It is “us” and “them.” Them are all those dirty rotten sinners in need of God. But isn’t that me too? I am in need of God. I have questions. I have struggles. I have sinned (but not today I say in my regular image denial). Truth is there is no line. There is this long path with some places wide and some places narrow. We (us and them) are all at some point along that path. There is a line on the path drawn by the blood of Jesus. While crossing that line brings about many good things in a person’s life and a chance for a new start, the path narrows and there is a cross waiting for us to pick up. I personally may be further along that path which means I have more responsibility and more expected out of me but there is no line along that path that I have crossed and have “made it.” I have created that line to preserve this image I want of myself. It’s an image that I care about more sometimes than I do for lost and loved souls. Thankfully I learned this early on in my ministry. I saved years and years of presenting myself as a finished project to all the people I’ve preached to. I have not exhausted my efforts to preserve this false image. So today I declare I am slightly braver. Slightly braver than I was yesterday. And I will continue to move forward with more good days than bad days while feeling the pain that life causes and feeling the struggle that hope is as I make Plan B.